This dish came to me from a lady in New York. She was having a reunion and wasn’t going to make it in time to bring her passing dish. So, that is why she called me! For those of you that don’t know I’m a caterer. Catering to the Max, thats my business name after my soon to be 9 yr. old son Max. Well, after making it the first time and doing some internet searching I’ve come up with my own recipe. I hope you enjoy it. 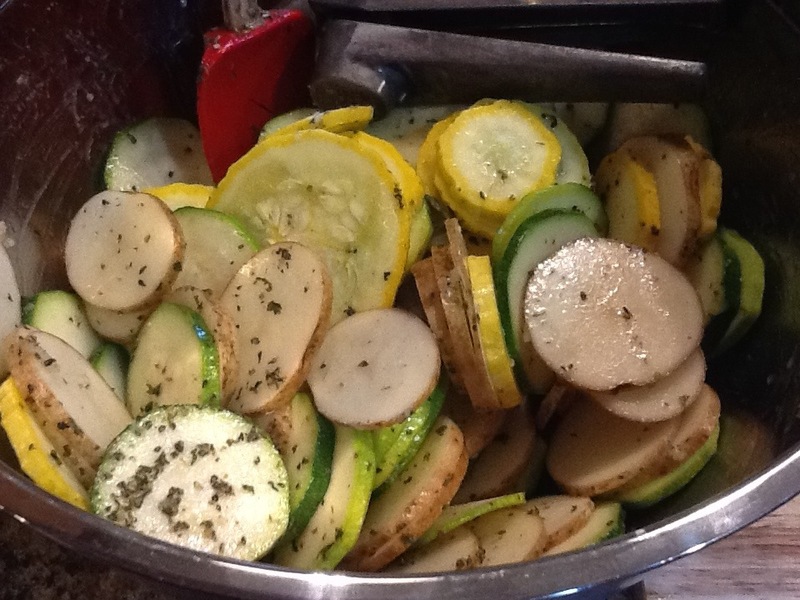 Now is the time to make this dish, ALL these veggies and herbs are in season. 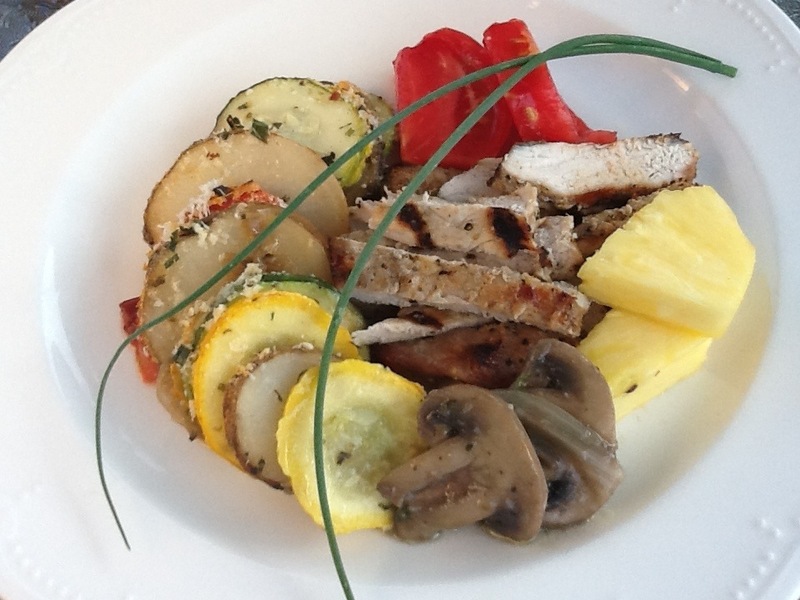 This dish is very pretty and goes well with all proteins. This is also a great alternative to high fat side dishes like mashed potatoes and macaroni and cheese. Although those are delicious items, this is just something different and fun to serve to the family and guest. 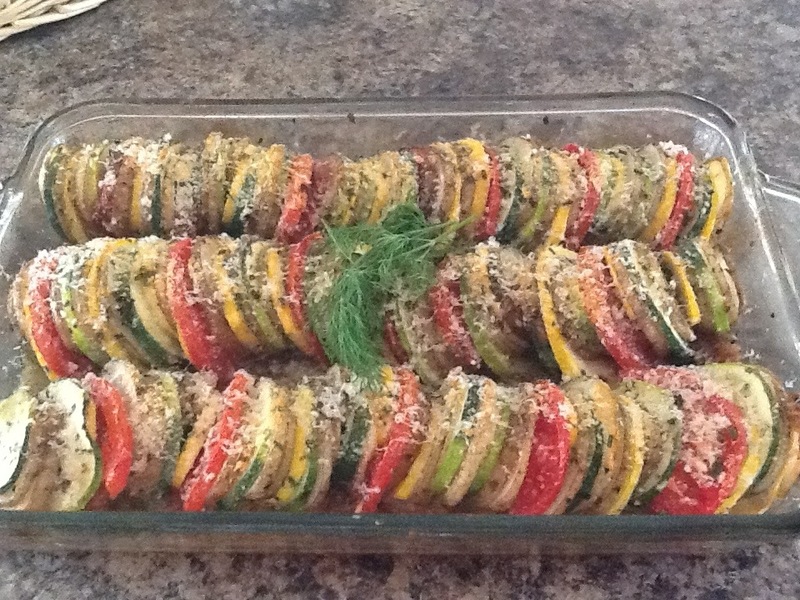 Hopefully Vegetable Tian will be on a normal rotation on your dinner menu. Rinse and clean all ingredients. 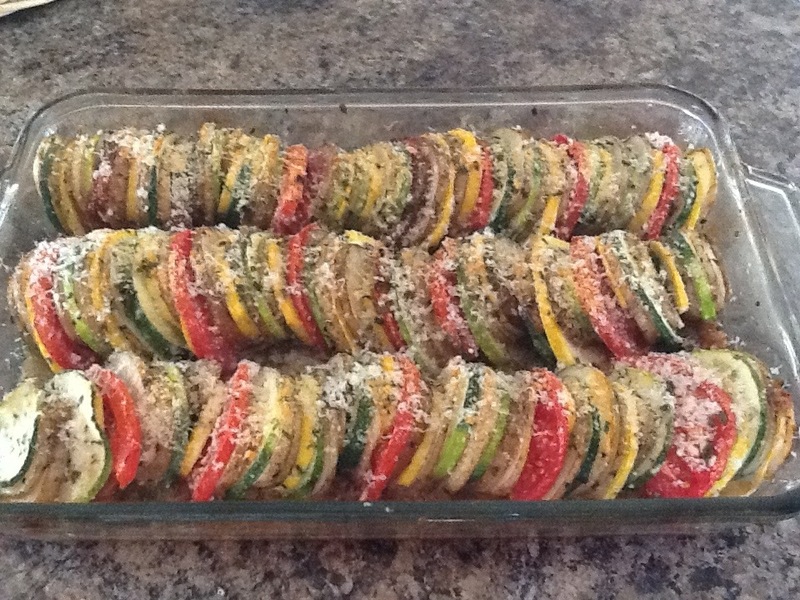 Set aside the zucchini and summer squash. Start slicing the onions. I use my trusty cast iron pan. I love it! It is well seasoned and does the job perfect for me every time! Never put in dishwasher! And after washing with hot water make sure you dry thoroughly so rust doesn’t start. 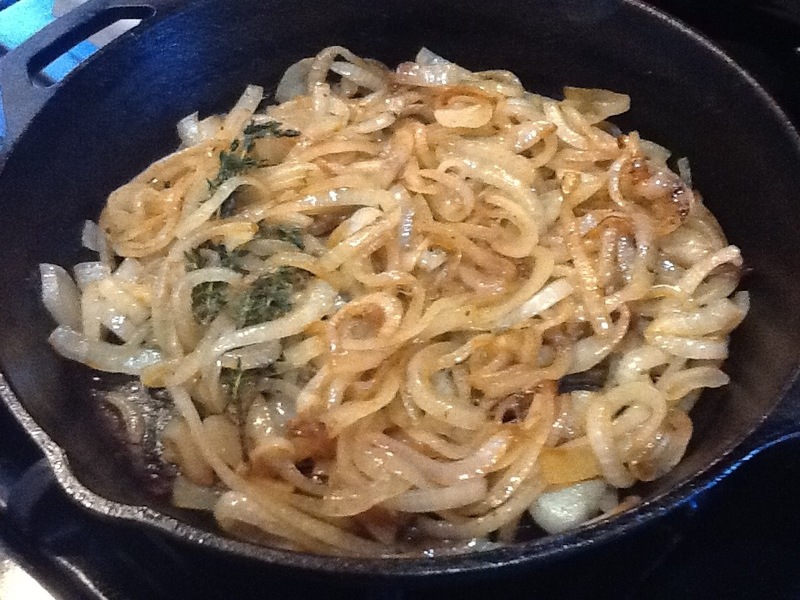 Put olive oil/butter in pan and heat first before you put in the onion. Once you added the onions you should hear a STRONG sizzle. Then turn heat down to med/low. 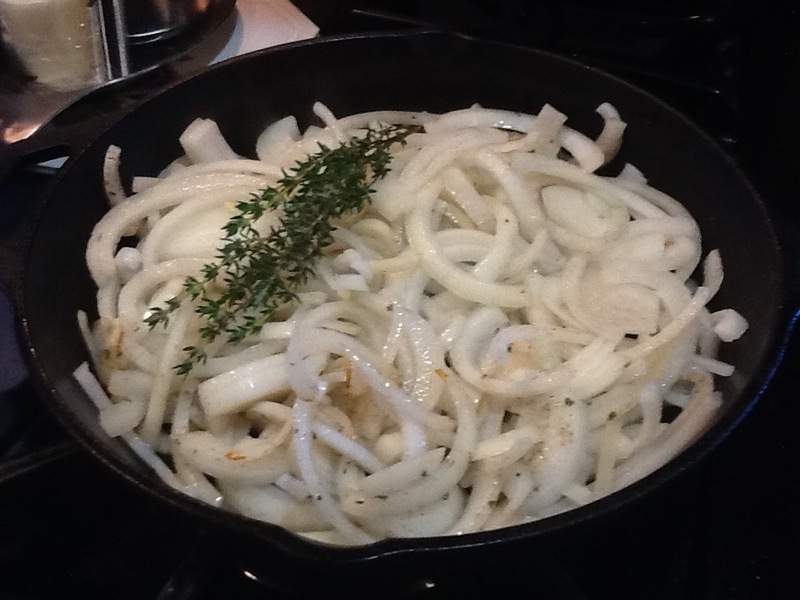 Don’t cover the onions because that will create a trapped steam, leave uncovered turning onions every few minutes. If they look like they are burning, turn heat down. Add salt to bring out the moisture and to enhance your base layer. While your onions are cooking start your slicing. The color is changing, keep going. 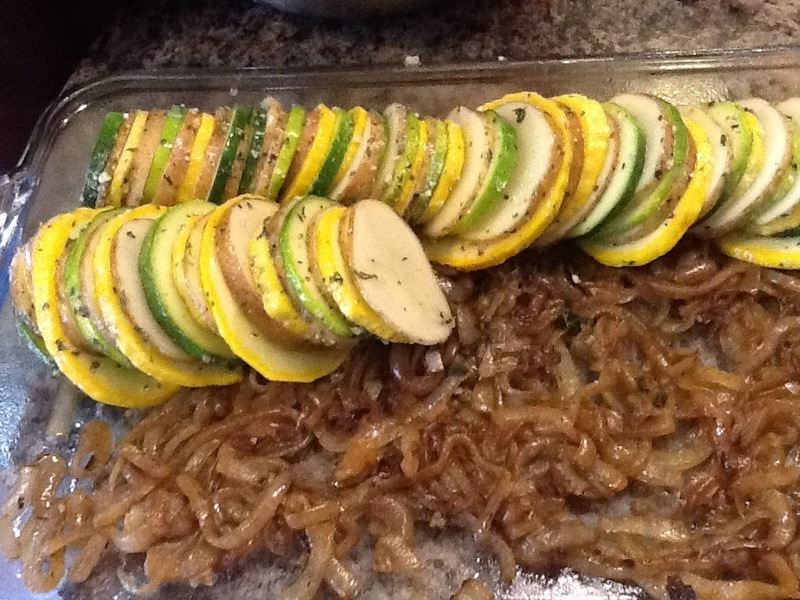 The color change is the natural sugars releasing and causing the caramelization to begin. So, yummy! Done! Remember caramel is a brown rich color. These even taste sweet. 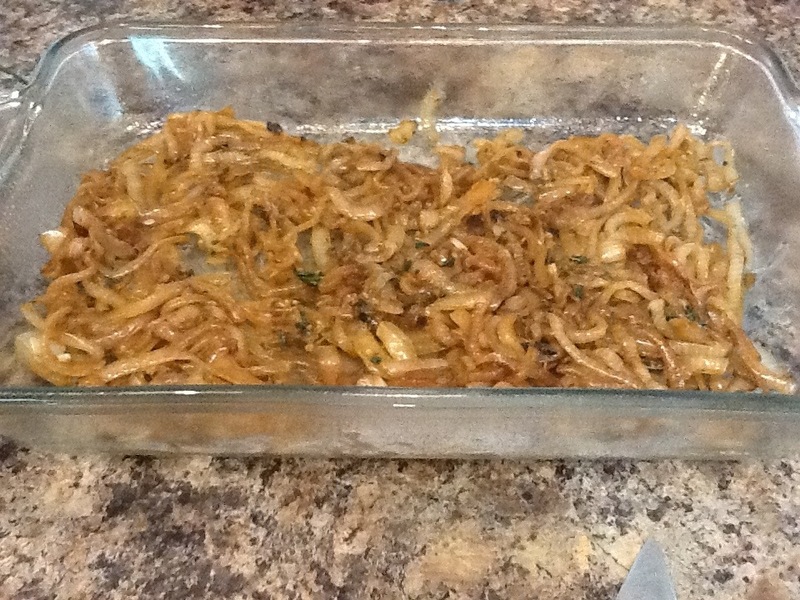 There’re so many things you can do with caramelized onions. Try them on grilled pizza with pears and gorgonzola cheese. So, good! 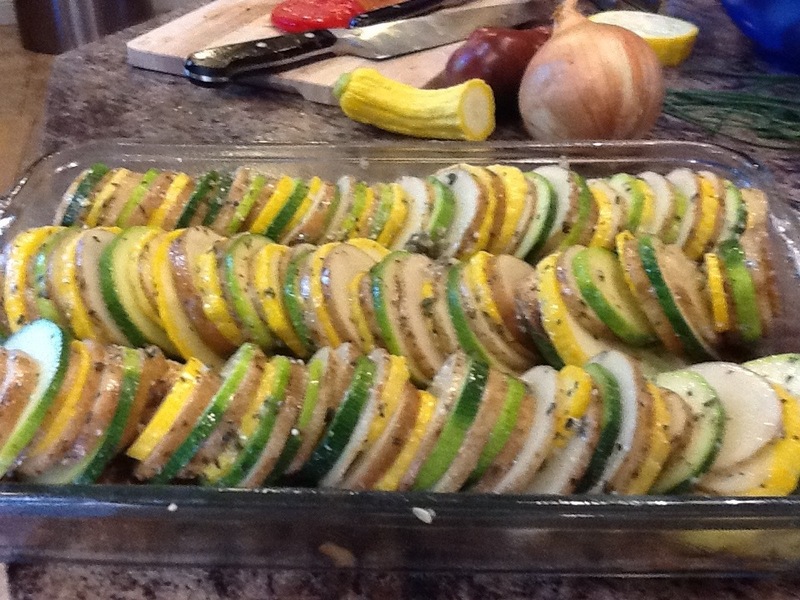 Now take your sliced zucchini, summer squash, crushed garlic, potatoes, olive oil & herbs and toss until everything is well coated. 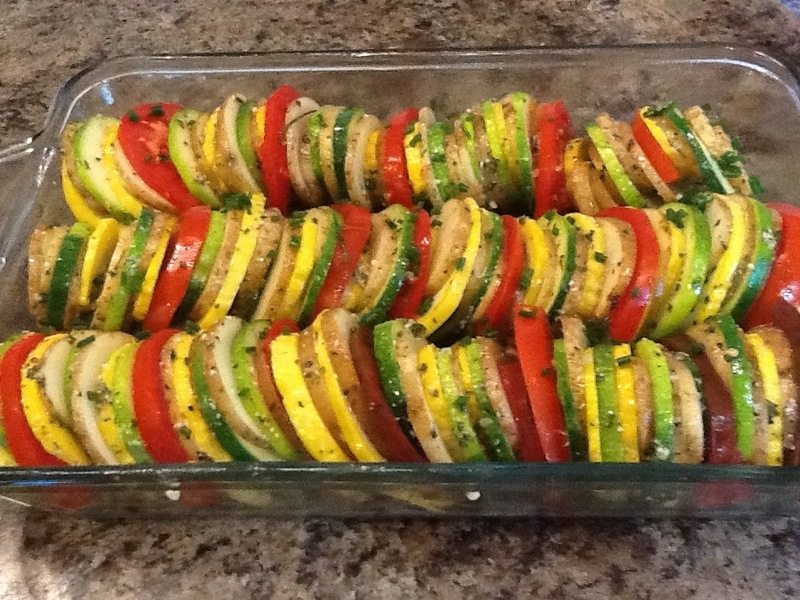 Start gathering your veggies into whatever pattern you’d like. Pack in tight! 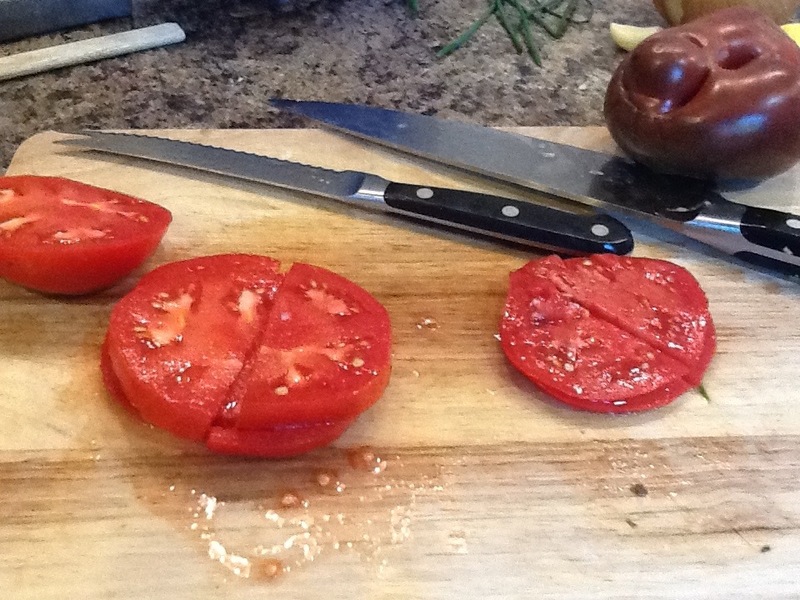 Slice your tomatoes and place between the veggies. This adds great flavor and color. Add whatever cheese you like. 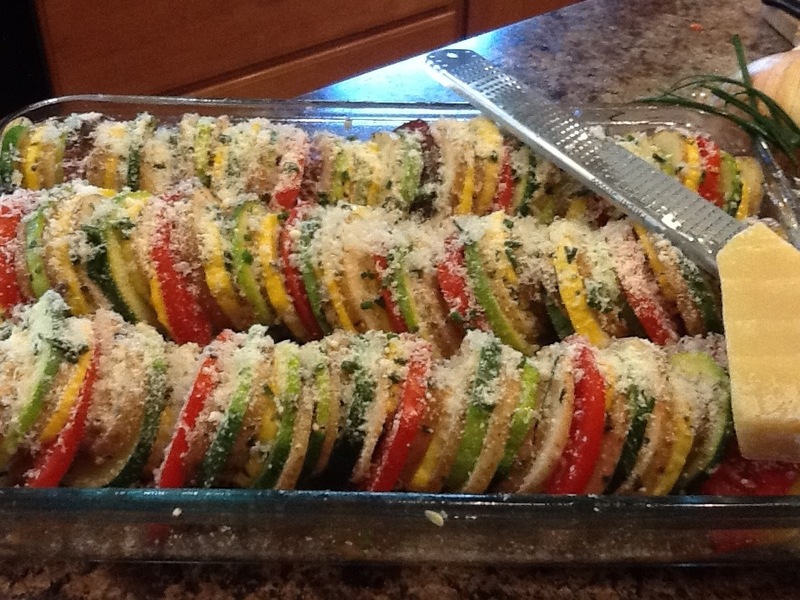 On this one I grated parmesan before and after the baking. Bake the first half covered, you want to generate some steaming action to cook the potatoes. 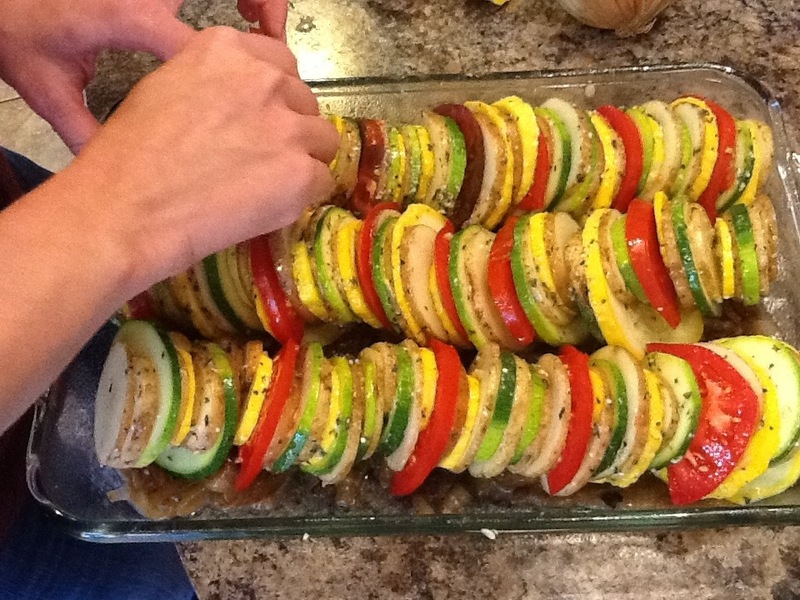 Then uncover and crisp up the veggies. Yes, I made that bread too. 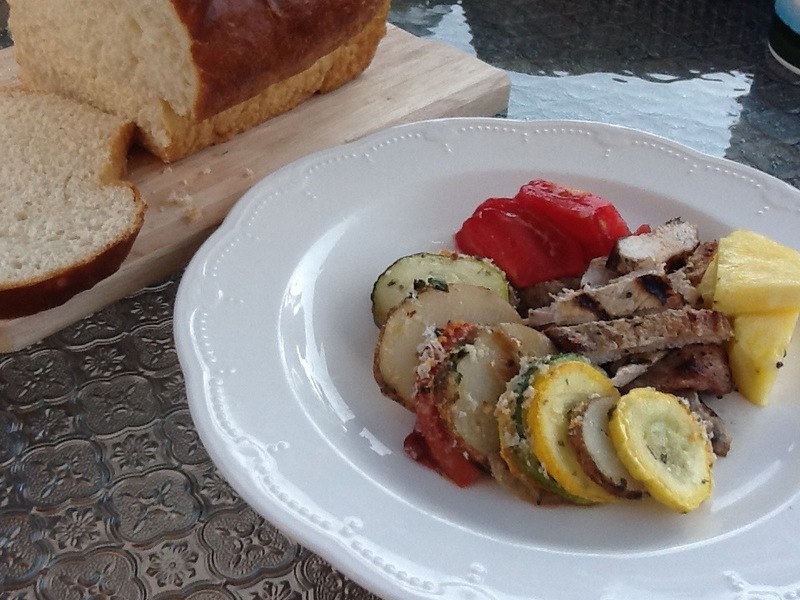 Having a bread to soak up the veggie juices is just delicious! 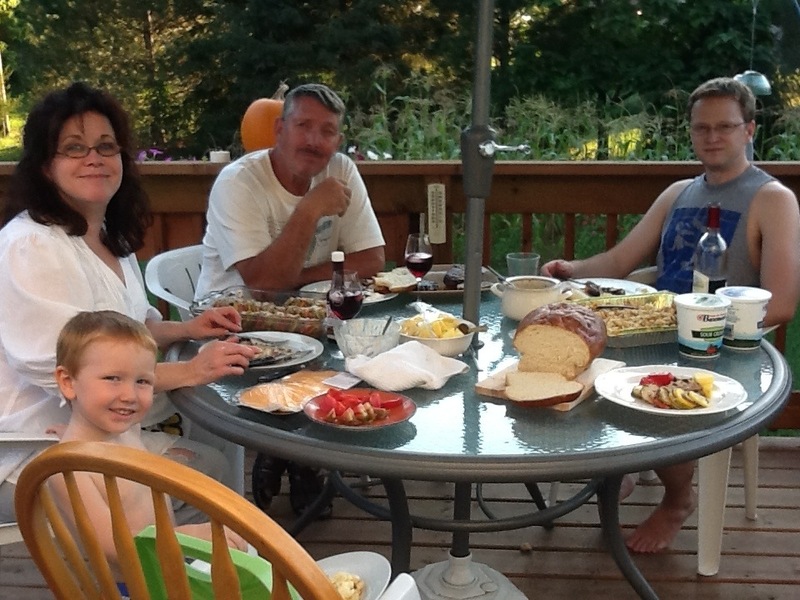 Food always brings family together! Preheat oven to 375. Grease/spray a 9×13 set aside. Slice onions about 1/4 inch thin. 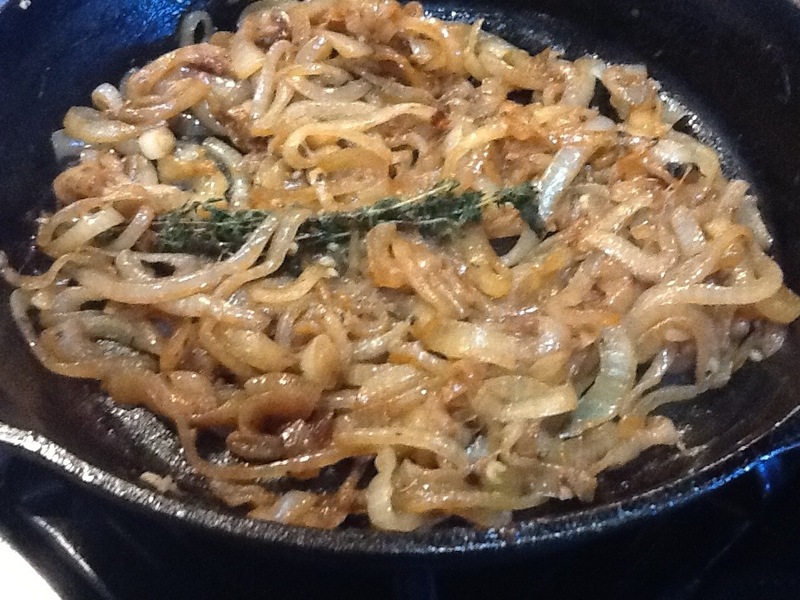 Drizzle sauté pan with olive oil place in the sliced onions, thyme, salt and pepper to start the caramelization process. 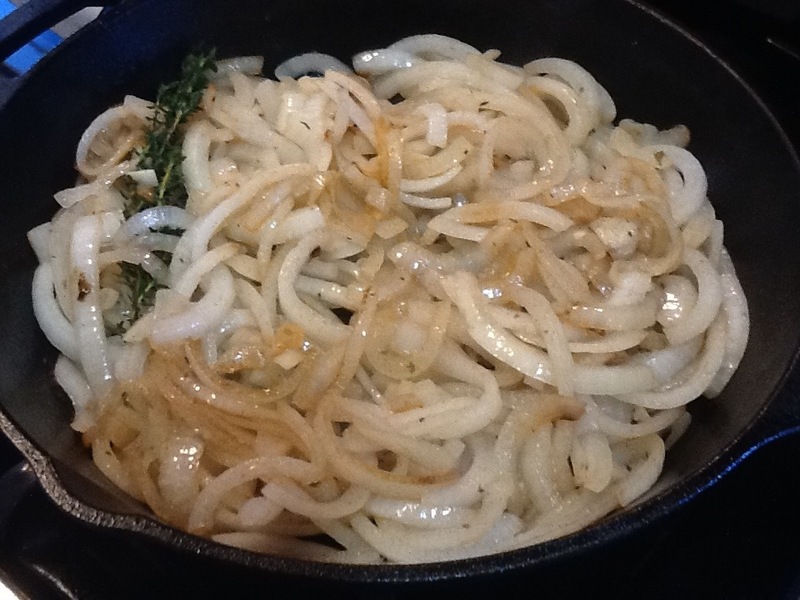 Once your onions are nicely golden and sweet in flavor, add to the bottom of your prepared 9×13. 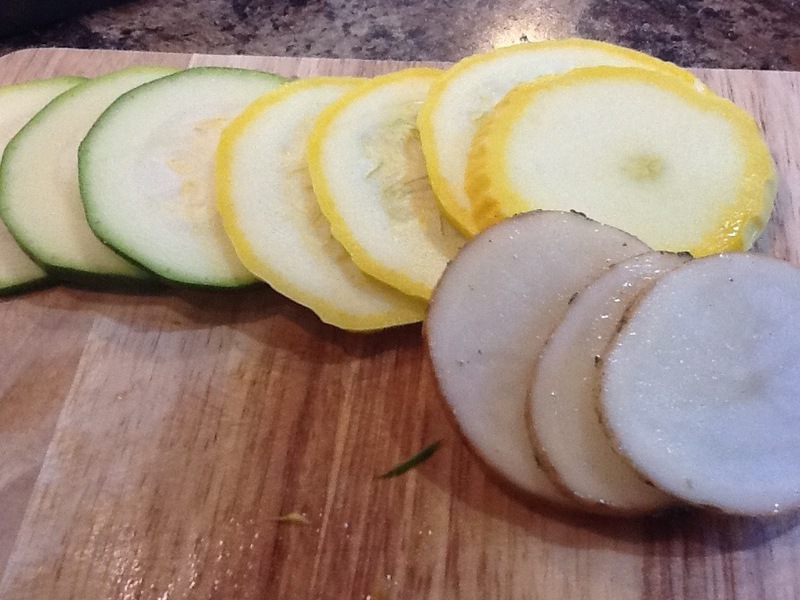 Slice zucchini, summer squash and potatoes 1/4 inch thin. Place in large bowl. 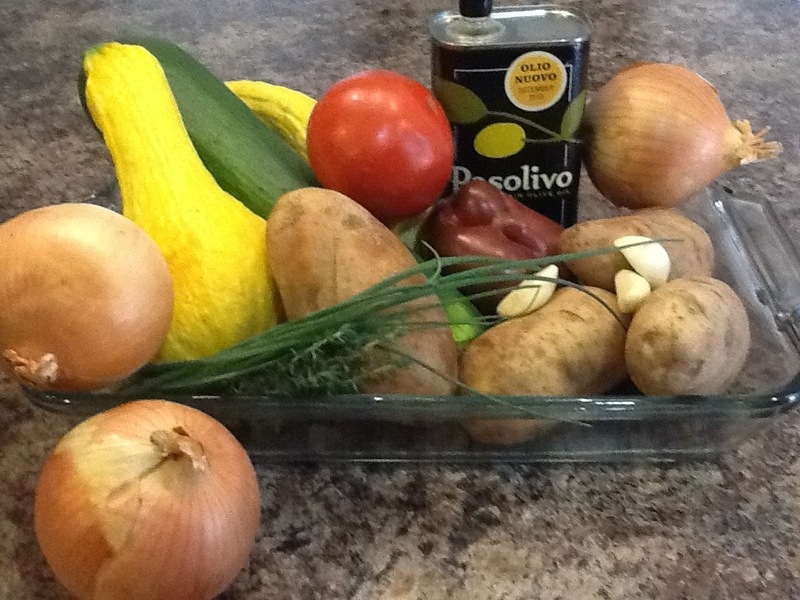 Add crushed garlic, Italian seasonings and drizzle 4 Tablespoons of olive oil, season with salt and pepper. Toss until everything is coated. Start your pattern as you desire, place on top of caramelized onions.When done add sliced tomatoes and sprinkle with desired cheese. (feta would be yummy too!) Bake for 45-55 minutes. Bake covered for 25 minutes then remove foil. Once done, sprinkle with fresh cheese and herbs if desire. Enjoy! Love, love, love your photography and text! I’m immediately hungry and whaddyaknow, I have the necessary ingredients! ‘Cept, it’s only breakfast-time – look out later tho! Thanks for sharing! Love your blogs!!!!!!!! Yum! I can’t wait to make it 🙂 so pretty too!! Ok. Absolutely making that tomorrow. It looks delicious!